Oklahoma, already recognized as one of the most backward states in the nation, tried to execute a guy tonight and failed. Tulsa TV station KJRH said the supposedly lethal drug combination that officials were using to kill 38-year-old Clayton D. Lockett didn’t work and he died of a heart attack. 6:23 p.m. – The injection process begins. Lockett has heavy, slow blinks, laid still. 6:29 p.m. – Consistently closed his eyes. 6:30 p.m. – First check of consciousness; still conscious. 6:33 p.m. – Announced Lockett was officially unconscious. 6:34 p.m. – Lockett started to move his mouth. 6:36 p.m. – Lockett began convulsing and mumbling. 6:39 p.m. – Prison officials lowered the blinds. 7:06 p.m. – Lockett dies of massive heart attack. The second part of a scheduled “doubleheader” execution was postponed, sparing 46-year-old Charles F. Warner, at least for now. The scene of this certifiable disaster was the Oklahoma State Penitentiary in McAlester. State corrections director Robert Patton halted the attempted execution about 20 minutes after the first drug was administered. He said there was a vein failure. This was almost too predictable. Death-row inmates in both Missouri and Oklahoma have appealed their sentences in recent months, questioning the make-up of the drug “cocktails” being used in executions. 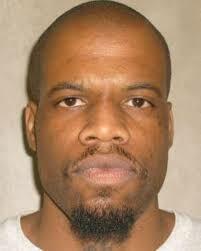 Nevertheless, executions in both states went forward, until tonight. I don’t care what Lockett or any other death-row defendant did — Lockett was convicted of shooting a 19-year-old woman in 1999 and having her buried alive, and Warner raped and killed an 11-month old girl — we as a society do not and should not endorse the application of cruel and unusual punishment under any circumstances. About the only good thing that this debacle will accomplish, in all likelihood, is end death penalty in most states except Texas, where, I fully expect, execution as spectator sport will continue unabated. Before the scheduled executions in Oklahoma, corrections department spokesman Jerry Massie told reporters that the state had never used the drug cocktail that was to be used in Lockett’s and Warner’s executions. As a result, he said, it was unclear how long the executions might take. Fact is, none of the Okies involved in the slaughter knew much of anything; they just plowed ahead, believing it was their official duty to put Lockett and Warner to death, however ugly that might turn out to be. And, God, was it ugly. No big deal, but I think you mean writhing on the gurney, not writing. I’m going to leave it just as it is, so everyone can get at least one laugh out of this story and your comment…On I writhe! You and I are in the minority….around the water cooler this morning it was clearly on the side of ‘he got what he deserved’. Oh, what we have become in this country. Although I am personally opposed to the DP, I understand for those heinous crimes its an acceptable punishment. This mess yesterday. Good God. How does a society accept the cluster that happened and dismiss it so easily? The states have punish with the death penalty will continue. It is sad that mistakes were made. But is also sad the crimes were committed. I wonder if the survivors of his victims are as outraged as the bleeding hearts out here? I wonder if he suffered as much as the Ambassador who was tortured and killed at Behghazi along with the heroic Navy SEALs while our self-serving leaders with “other agendas”, refused them assistance which was readily available? I wonder if Oklahoma will devise a massive cover-up to fool the public as the Obama administration has now been proven to have done? I wonder if the KC Star will find a way to blame the NRA for the mistakes made in disposing of this criminal? Is this the guy who buried a young girl alive? And you’re worried that he might have had a hard time? I agree with you except on one point: Kansas is more backwards than Oklahoma by any and every measure. I’m pretty sure that Arkansas and West Virginia residents send thank-you notes to Kansas regularly now just because they’re so grateful not to be our national punchline any more. An online story in The New York Times this afternoon has a great quote from Ryan Kiesel, executive director of the Oklahoma branch of the American Civil Liberties Union. Take a poll and i’m betting the average citizen would like to see a method for croaking these scumbags that inflicted a little suffering. The disgrace are the 7 corrupt dwarfs of the Kansas Supreme Court who continue to obstruct the wishes of juries who recommended the death penalty simply because they think that they’re damn well above the law. I’d like to see the legislature pass a law releasing these monsters to the personal custody of the Supreme Court Justices if they’re not dead within 90 days of the close of the trial. Perhaps that might speed up the appeals process, or, just as well, the demand for new justices. The horror of the crimes is not debatable. The challenge, who is changing who? Should we lower our behavior to that of the killers? Just get a rope. These drug cocktails are around because there’s a bunch of whiners out there that think these scums should have a peaceful and painless end to their life, or that we good citizens are obliged with paying their rent for the rest of their lives. What is wrong with people these days?! Go ahead, let killers live…hell, just let them go free so they can kill again. It’s okay, really. While your at it force me to pay for things I don’t want, tap my phones, video me wherever I go, confiscate my cell phone if you feel the need to. I’m just glad they got at least one of Ann Harrison’s killers before this gave the bleeding hearts another soap box to stand on. Oh, and while we’re at it, lets prosecute people for defending themselves against these pieces of $#!+. I’m so mad right now that my ears are turning red and I may have damaged my key board. Sarcasm and silliness aside, I just don’t get it, liberals seem like they’ve never seen a baby they wouldn’t kill, or a killer they wouldn’t baby. Conservatives, on the other hand would protect innocent life and punish the guilty. Just chatting with a few friends and we’re thinking they ought to patent this method and see if they can’t replicate it on the next guy. Oh, and we would never prosecute anyone for engaging in self defense. That’s true–we love killing babies and nurturing violent criminals. It definitely seems like you have a strong grasp on reality, excellent critical thinking skills, and a thorough understanding of the nuances of American politics. Good for you. I’m glad you post here under your real name so that I can keep a wide berth between us. It doesn’t take critical thinking skills to draw the conclusion that persons who advocate abortion and oppose capital punishment would sooner kill a baby than a violent criminal. So yes Andrew, by your admission, it is true! I have also (thoughtfully) included my last name so you can be sure to separate yourself from me as well. I won’t go out of my way to avoid you however. Just because I don’t agree with you doesn’t mean I don’t like you, or should feel the need to distance myself from you. Who knows, maybe one day you might embrace rational thinking. Don’t feed the trolls Andrew. But they do make me chuckle on a regular basis. Troll? Don’t think so. I don’t post on everything Jim writes, but I am a regular on this forum. Nothing I said was off topic and if truth is inflammatory…well I can’t really help that can I? Thanks. Like I said, chuckle, chuckle……I can’t really help that, can I? The sooner to the gallows, the sooner that debt is paid. “Writhing” is such little, little interest on such a sum as that life borrowed, especially in this circumstance. Murdered, burried alive after being shot. She must, must have prayed and cried out as the dirt hit her face. This POS goes to the devil with a bill still due. I find it rather interesting that the more “civilized” we treat criminals, the more uncivilized society gets. Civilisation has seldom had much respect for the rules it espouses. OTOH, things are getting rather less civil. Weird contradictions, it seems liberals are for abortion and against the death penalty, and conservatives are against abortion but for the death penalty . just saying. SO, WHAT DO YOU EXPECT FROM AN OKLAHOMAN..”SOONER” OR LATER, THEY WILL GET IT RIGHT!